The Orchard at the Carneros Inn in Napa, California, was recently featured in the New York Times “Breaking Ground” section. A total of 17 fractional ownership cottages are planned, with half already built. The 2-bedroom cottages are being sold in 1/10th shares. Owners will be able to enjoy all the amenities of the Caneros Inn, including a spa, fitness center, and three restaurants. 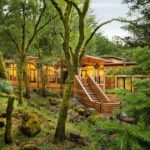 The property is located at the southern end of the Napa Valley. Prices start at just under $300,000. View more Fractional Spa/Retreat Properties like this one in our Fractional Property Directory. Join Equity Residences with a 10% deposit for a limited time. Details inside.